May 21, 2018 at 11:47p.m. Photo by David Dermer | Phantoms forward Curtis Hall looks for the puck while being checked by Fargo’s Robbie Stucker during Friday’s game at the Covelli Centre. Hall is projected to be a fourth-round selection in June’s NHL Draft. 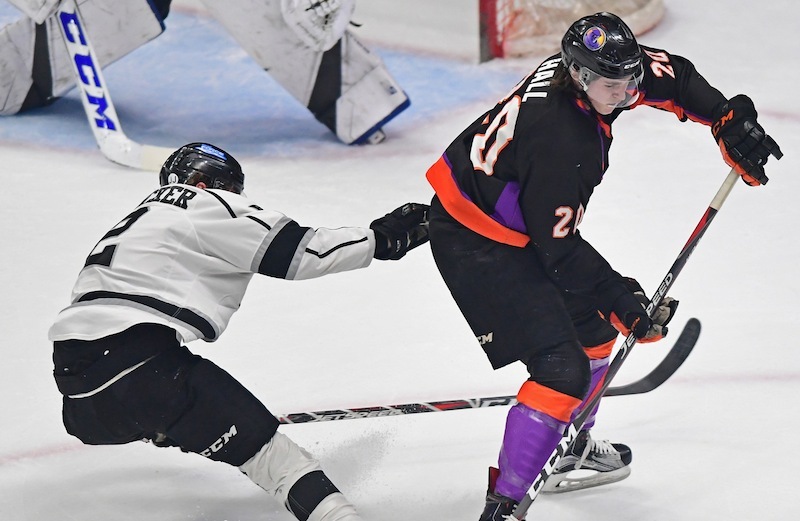 The five players acquired after Halloween played major roles in carrying the Youngstown Phantoms through their most successful postseason. In their ninth USHL season, the Phantoms won the Eastern Conference for the first time to advance to the Clark Cup Final. Last weekend, the Fargo Force won the Clark Cup with a 3-1 series victory over the Phantoms. In late January, a chance to play for the trophy seemed remote as the Phantoms came back from the Christmas break in a funk, going 2-8-1-0. In November, Phantoms General Manager Jason Koehler began remodeling the team by acquiring forward Joey Abate from the Omaha Lancers. In January, forwards Nicholas Cardelli and Dalton Messina left the Cedar Rapids RoughRiders for the Mahoning Valley. Then defensemen Michael Callahan and Jason Smallidge were rescued from the last-place Central Illinois Flying Aces. The newcomers clicked with the talented group already calling the Covelli Centre home. Cardelli and Abate became linemates with captain Eric Esposito. Callahan and Smallidge played top four minutes down the stretch. Messina filled in where needed. And the Phantoms did not lose a game in regulation in March (9-0-1-1) to surge to a second-place finish. “Each one of those guys we acquired” made an impact, Phantoms head coach Brad Patterson said Monday. “They were identified as guys who were going to come in ... and be a playoff competitor. Callahan paired up with Michael Joyaux while Smallidge’s partner was Liam Dennison. Injuries plus a leave of absence for alternate captain Jake Gingell (his family suffered a tragic loss) took such a toll that there was a stretch of about seven games where four defensemen were playing most of each game. Early on, Michael Regush’s line (Chase Gresock and Matthew Barry) emerged as the team’s best on offense. Barry led the team with 54 points in 57 games. Regush scored 48 while Grescock led the Phantoms in goals with 26, three more than Esposito. Cardelli’s brightest moment was his overtime goal to win Game 2 of the Clark Cup Final. Cardelli started the season in Fargo before being traded to Cedar Rapids. In the fall, those players will be off to college. Heading into this weekend’s tryout camp at the Deep Freeze Ice Arena in Boardman, five forwards and four defensemen could return for the 2018-19 season. The forwards are Abate, Messina, Jack Malone, Craig Needham and Trevor Kuntar (Max Ellis might be off to Notre Dame and Finland’s Samule Salonen has several options). Defenders eligible to return are Dennison, Steve Holtz, Gianfranco Cassaro and John Larkin. They won’t be skating in the tryout camp because of the playoffs just ending. As for goaltenders, Ivan Prosvetov played all 11 playoff games and the Moscow native is eligible to return. So is Wouter Peeters, a third-round draft pick of the Chicago Blackhawks in the NHL’s 2016 Draft. Patterson said both goalies could turn professional but Peeters will be in camp this weekend. The Hockey News projects Hall, who scored 31 points this season, as the 97th-best player available. Patterson thinks Prosvetov and Callahan also will be drafted. Tryout camp will conclude Monday. Most likely, the team’s official roster will be released in early July.